Studies in the past have linked smoking cigarettes to psychosis, but the exact relationship between the two is still a point of contention in the scientific community. Previous research has led scientists to hypothesize that schizophrenics are more likely to be smokers because of the counteractive effect it has on the medication or even on symptoms. However, researchers from U.K.’s King’s College London are challenging this hypothesis in a new meta-analysis that uses 61 observational studies involving 15,000 participants who use tobacco and 273,000 non-tobacco users. The findings, which have been published in the journal Lancet Psychiatry, revealed that more than half (57%) of the individuals who presented a first psychosis episode were smokers. In order for the hypothesis—that people who suffer from psychosis are more likely to be smokers—to be true, smoking rates would have increased after someone developed psychosis. But as this study’s findings show, that isn’t the case 57% of the time. The data from this new meta-analysis also showed that daily smokers developed a psychotic illness, like schizophrenia, one year earlier (on average) compared to non-smokers. While determining the order of causality is difficult, this meta-analysis does, in a sense, debunk the hypothesis that patients who are diagnosed with psychosis are more likely to smoke as a means of coping with their illness. Instead, perhaps smoking cigarettes should be taken more seriously as a contributing risk factor. Study researchers proposed a new hypothesis to explain the link between smoking and illnesses like schizophrenia—they believe the excessive nicotine exposure increases the release of the neurotransmitter dopamine, which in turn leads to the development of psychosis. More long-term studies are still needed to investigate this hypothesis further. 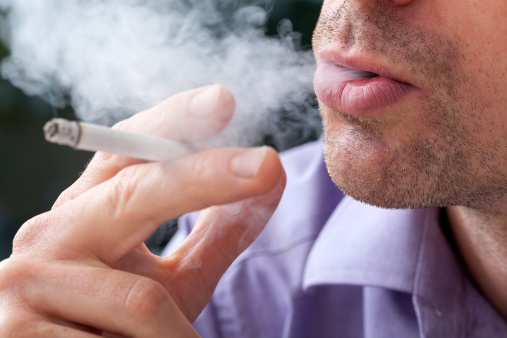 McNamee, D., “Does cigarette smoking contribute to schizophrenia?” Medical News Today web site, July 10, 2015; http://www.medicalnewstoday.com/articles/296639.php.